The Compounding Pharmacy of Beverly Hills offers hormone optimization for men and women, helping to get balanced hormone delivery through Bio-Identical Hormone Replacements. Contact us to see how we can assist you. Giving your pets their medication doesn’t need to be a struggle. The Compounding Pharmacy of Beverly Hills can help. Contact us today and speak with one of our pharmacist to see how we can help your pet feel better. The body needs regular doses of Vitamin D to remain healthy. A deficiency can negatively affect our moods, our weight, and even our skin tone and complexion. While many people associate Vitamin D with dairy products, we can also get a great deal of it from the sunshine. As winter is coming to an end, The Compounding Pharmacy of Beverly Hills gives you 6 signs that your body may be craving more Vitamin D.
1. You experience achy bones and joints. If you wake up in the morning with stiff joints and achy bones, you may be suffering from a Vitamin D deficiency. This nutrient is vital for keeping the tissues and muscle surrounding the joints well lubricated and functioning properly. 2. You feel down and depressed. A lack of Vitamin D can wreak havoc on our emotions. This nutrient helps the body to produce the necessary levels of serotonin that helps us feel happy and energetic. During the fall and winter, many of us tend to spend more time indoors. Since sunshine is a leading provider of Vitamin D, we can easily begin to feel moody, sluggish, and slightly depressed. 3. You are over 50. As we get older, we tend to spend less and less time outdoors, even when the sun is shining and the days are warm and beautiful. Also, our kidneys begin to slow in their conversion of Vitamin D, according to the American Cancer Society. Therefore, recent medical research suggests that we are far more likely to suffer from a Vitamin D deficiency as we approach 50 years of age and older. People who are overweight produce Vitamin D at the same rate as those who are not. But the higher concentration of body fat has a direct effect on the amount of Vitamin D that makes it into the bloodstream. Vitamin D is fat-soluble. The more overweight that we become, the more diluted the Vitamin D becomes in our bodies. As a result, those who are overweight or obese require higher doses of Vitamin D to achieve the standard level of positive health benefits. 5. You have a darker complexion. Those with a naturally darker skin tone require up to ten times more Vitamin D that those with a fairer complexion. Our skin acts as a type of natural sunscreen. When our skin tone is darker, we are automatically at a disadvantage because our skin is less able to absorb the Vitamin D from the sun. 6. You are experiencing gut trouble. Those who suffer from irritable bowel syndrome, celiac, or Crohn’s disease are more highly susceptible to a Vitamin D deficiency due to the way that their gastrointestinal tract absorbs fat. Lower fat absorption also means that our bodies cannot also absorb the fat-soluble Vitamin D as well. Fear not! A deficiency in Vitamin D is easily correctable. Contact your friendly pharmacists at The Compounding Pharmacy of Beverly Hills today for more information. With summer around the corner, it seems that most everyone is trying to lose at least a little weight. But the solution to weight loss transcends dieting and exercising: Your struggle with losing weight could be due to issues in your thyroid, your adrenal and your insulin levels. Compounding is a way that can help you counter these issues in your thyroid, adrenal and insulin glands – the issues that are keeping you from being the healthiest version of yourself. Pharmacy compounding is a way of personalizing the dosage of your medicine. General physicians typically prescribe medications to their patients that are one-size-fits-all. However, you’re your own person, with unique needs. Not everyone will have the same type of hormone problems that you’re experiencing, and you’re going to need medicine that can meet you where you are. Hypothyroidism means that you have low levels of your thyroid hormone, which causes fatigue, fluid retention, constipation, sore joints and muscles, depression, slowed metabolism and weight gain. Besides the actual weight gain side effect of hypothyroidism, you have all these other symptoms that make you too tired or too depressed to physically work off the weight. It causes a lot of problems. Compounding can help with these issues by supplying your body with a series of natural thyroid hormones. Compounding can, in a way, trick your body into thinking it’s producing the natural thyroid hormones it needs to supply you with energy and heighten your metabolism. General prescriptions for synthetic thyroid hormones make an effort to combat the symptoms of hypothyroidism that lead to obesity, but not nearly to the extent to which natural thyroid hormones can help. Similarly, adrenal hormone dysfunction also causes weight gain. Adrenal issues start to appear once people hit middle age. Particularly, a disorder called Adrenal Fatigue leads to many serious health issues such as allergies, autoimmune disorders, cancer and obesity. Your adrenal glands are partly responsible for turning your carbohydrates and fats into energy, but Adrenal Fatigue stops the transformation process and causes your body to retain the fats. What’s more is that if you’re not feeling like your usual, healthy self, then you’re probably not feeling up to going to the gym to work off some of the weight you’ve gained since your adrenal glands started malfunctioning. Compounding (creating natural adrenal hormones that are measured according to your unique needs) can help restore your adrenal glands over time to their rightful condition. By supplying your adrenal glands with the hormones they need to function properly, your body will start processing carbs and fats as energy again, which will not only keep you from gaining more weight, but it will also give you the energy you need to work off the weight that you gained. You might recognize insulin as the gland that is associated with diabetes. Diabetes is a disorder that results when your pancreas stops producing the proper amounts of insulin, which keeps your body from regulating your blood sugar levels the way it’s supposed to. What’s more is that insulin is also what’s responsible for keeping your metabolism at a healthy pace. If your insulin levels are depleted, then your metabolism will plummet as well, causing you to gain weight. Hormone therapy that results from pharmacy compounding can be the weight loss solution you’ve been waiting for. By restoring your body’s insulin levels to their rightful condition, you’ll be able to process blood sugars the way that you’re supposed to, which will cause your metabolism to go up. This will not only keep you from gaining more weight, but it will also help you lose weight during the process, without lifting a single dumbbell or running a single mile. The Compounding Pharmacy of Beverly Hills specializes is compounding hormone therapy that can help you on your unique journey to the healthiest, happiest version of yourself. Not only can we specifically aid you in your efforts to rectify your thyroid, adrenal and insulin glands, but we can also help you with other compounding efforts to help you lose weight in general, once the weight-gain-causing symptoms have subsided. Contact ustoday to learn more! Can a Pet Catch a Cold From Their Owner? Now that cold season is upon us, do you ever wonder whether you are contagious to your cat or dog? The truth is that pets can catch a cold, but it is not the always same type of illness as the one that affects us. With cats, however, the story is different. Fluffy may possibly catch a cold from you. The cold virus that can make you feel miserable can make your cat sick as well. Cats can also transmit viruses between each other, but we cannot catch those viruses from felines. The Compounding Pharmacy of Beverly Hills can prepare medications for your pet in flavors like beef, liver, chicken or tuna that your furry friends will find easy to take. We can also create different dosages and forms in some medicines, such as a transdermal gel for pet that have a tough time swallowing their medication. You’ll feel better knowing that your pet is getting the medicine they need to get on the road to good health. Contact us today to learn more about how our pet compounding pharmacy can help your furry companion feel better. It is important to remember when buying any supplement to consult a health care professional well trained and familiar in their usage. The Compounding Pharmacy of Beverly Hills specializes in providing these products, and ensuring their quality and safety. Proper heart health is as essential to your overall well-being as any other aspect of your life. Be sure to take the time this month to pay attention to your “ticker”, it might just save your life. Contact The Compounding Pharmacy of Beverly Hills to see how we can assist you in maintaining a healthy heart. Sports medicine compounding from The Compounding Pharmacy of Beverly Hills is the best way to deal with your injuries and get you back on the field, court or track quickly. A compounding pharmacist, like ours here at The Compounding Pharmacy of Beverly Hills can prepare a special formulation to treat blisters or calluses or make a custom formulation to treat athlete’s foot or other anti-fungal conditions. Rather than taking several drugs following an injury, a compounding pharmacist can combine more than one medication into a single dose. Athletes are particular about their diet, which causes them to carry more muscle and less fat than the average person. As a result, they burn calories at a different rate than a more sedentary person. Our compounding pharmacists take these factors into consideration when preparing medications for higher level athletes, to influence a faster and more effective healing. Compounded medications are available in a number formulations. Tablets and capsules must pass through the digestive tract before they make their way into your system and can start to work. If you are taking an anti-inflammatory or a muscle relaxant, you run the risk of experiencing stomach upset or other issues. Our compounding pharmacists can provide you with a transdermal pain cream for sports injuries that can be applied directly to the area. You can get the relief you need quickly, with fewer side effects. Would you like to learn more about compounding your sports medicine at The Compounding Pharmacy of Beverly Hills? Contact us today to find out how we can work with your doctor to find the right solution for your needs. Recently there has been an increased interest in compounded anti-aging medications including topical medications, hormone replacement therapies and more. Compounding pharmacies such as The Compounding Pharmacy of Beverly Hills can create customized anti-aging medications in a wide range of different delivery formats including creams, gels, lotions, balms, ointments and more. Topical anti-aging medications can improve skin health, restoring it to a more youthful appearance and hormones can restore decreased crucial hormone levels. Compounded topical medications can be used to treat a wide range of different skin conditions and reduce the effects of aging on the skin that most people are familiar with: wrinkles, lines, a loss of elasticity, and spots. Compounded anti-aging medications and topical treatments are usually far more effective at treating aging effects compared to commercial medications because they are customized based on the patient’s needs, and dosage levels are carefully selected. Customized anti-aging medications are designed specifically for the individual patient, and the delivery method is also customized based on the patient’s preferences. The dosage of the anti-aging prescriptions is carefully selected by a medical practitioner. Through various types of diagnostic testing the proper anti-aging medication dosage can be determined and then custom created at a compounding pharmacy. In the majority of cases the compounded anti-aging treatment will work far better than a commercial treatment, and patients will often prefer compounded treatments instead of commercial prescriptions because of their effectiveness. Anti-aging medications can be created to treat several different aging effects, and the benefit of using a compounding pharmancy is that the medication can be adjusted as the patient’s needs change over time. The environment, sun and wind damage, pollution, soaps and chemicals, stress, and poor nutrition can cause skin problems as a person ages, and every individual’s skin ages differently. Some people have fewer aging effects on their skin as they get older, and other people have more. Many of the forces that affect skin over time cannot be easily controlled such as sun damage or pollution, but there are ways to reverse this type of skin damage with compounded anti-aging skin treatments. Anti-aging creams and other anti-aging medications for skin can be created at compounding pharmacies with specific ingredients that are carefully selected by a medical professional to not cause any additional skin irritation or allergies while treating the causes of aging. Compounded anti-aging medications can treat a wide range of aging effects including: irritation, rashes, age spots, blemishes, inflammation, dry skin and more. Anti-aging creams may contain vitamin E, B vitamins and other vitamins and minerals, as well as active ingredients that immediately improve skin quality such as retinoic acid. Each anti-aging cream can be customized with ingredients for the particular individual. The concentrations of the ingredients can also be carefully controlled, which is important because many commercial products have lower concentrations of active and inactive ingredients, making them less effective. A properly prepared compounded anti-aging cream will almost always perform better than commercial products, and it will have a better result on patient’s skin because it is custom designed specifically for them. Side effects if any will also be minimal compared to commercial preparations that may have ingredients that cause irritation. At some point everyone will experience the effects of aging on their skin and body, and compounded anti-aging treatments offer the most innovative and modern way of treating aging effects. Compounded anti-aging treatments can help restore normal hormone levels that begin to decline for both men and women when they reach their late 30s and 40s. Men begin to experience testosterone declines as early as age 30, and women experience progesterone declines in their late 30s to early 40s. Both men and women can utilize compounded hormone treatments to reduce the impact of hormone losses and maintain a youthful body. Many of the effects of aging cannot be prevented, for instance the damage that the sun and pollution causes to the skin is just one aging effect that will occur over time for almost everyone. Anti-aging skin treatments can utilize many different nutrients including CoQ-10, green tea extract, and other nutrients reduce the impact of skin damage over time. Bleaching creams can be prepared using active ingredients such as hydroquinone, steroids or retinoic acid which can reduce hyper-pigmentation. A major benefit of using a compounding pharmacy is that the percentages of each active ingredient can be controlled based on the patient’s needs. Using a compounding pharmacy is simply the best way to guarantee that a skin care treatment is perfectly designed for an individual because every person’s skin is unique. An anti-aging checkup from an experienced and licensed medical practitioner can help a person determine which specific anti-aging treatments and medications that they may benefit from. Typically a full evaluation will be done of the patient’s current health status, and tests can verify if they have allergies, hormonal imbalances, nutritional deficiencies, or other health problems that may be causing aging effects. After the checkup, the medical provider can create a customized treatment program that will help the patient restore the hormone levels and cellular environment closer to what it was in their late 20s. A compounding pharmacy such as The Compounding Pharmacy of Beverly Hills can create the medications used for a person’s anti-aging treatment program on a regular basis, and the cost will usually be around the same as equivalent commercial preparations. Those who are interested in anti-aging compounded medications and treatments should speak to a medical professional that has experience with prescribing compounded treatments and can offer a diagnosis. The benefits of compounded anti-aging medications can be tremendous and life changing for those who suffer from some of the more significant effects of aging, particularly the effects of hormone losses. Energy levels can improve dramatically, nutritional deficiencies can be corrected, and youthful hormone levels can be maintained. When properly executed, anti-aging treatment programs are an effective way to reduce susceptibility to many of the effects of aging, but treatments can only be administered by licensed medical professionals, and the compounded medications should be created at a qualified sterile pharmacy by licensed pharmacists. The licensed pharmacists at The Compounding Pharmacy of Beverly Hills can create customized compounded medications for any anti-aging treatment. Contact us today to learn how we can assist you in with your anti-aging treatments. In our humble opinion, compounded medication is the best form of medication available. Unlike standard prescriptions, compounded medication is prepared specifically for each individual patient. Rather than taking medication that works for “most people,” our patients can be confident that their medication caters specifically to their unique needs. Despite its remarkable advantages, however, compounding medication at The Compounding Pharmacy of Beverly Hills is still sometimes misunderstood. This week, we want to help dispel some of the common myths surrounding our unique trade. The idea of straying from standardized prescriptions can be unnerving for some, but we want to stress that compounded medication is not a form of “voodoo” or “alternative” medicine. Compounded medication is safe, trustworthy medication just like the prescriptions you are used to taking – except it’s even better, because it’s designed to meet your unique needs. This myth could not be further from the truth. Compounding pharmacies must meet the strict standards by their boards of pharmacies. Our pharmacy undergoes routine inspections just like every other pharmacy, and we must follow the same types of regulations and standards. We have the capability to compound medication for most situations, but we are not authorized to do so without an official prescription from the doctor. Before we can compound your medication, you will need to get a prescription from your doctor. We are honored to have great relationships with most of the doctors in our surrounding area. Not only does compounded medication not pose greater risks than standardized medication – it is actually safer in many situations. 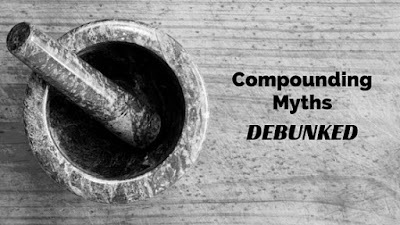 Because compounded medication is customized to meet each patient’s unique needs, it typically has better results and fewer side effects than standardized medication doses. You don’t have to take it from us, however! Our client testimonials speak for themselves. Learn More About Compounded Medication At The Compounding Pharmacy of Beverly Hills! We are firm believers in the healing power of compounded medication and we are proud to be the exclusive Beverly Hills pharmacy that focuses entirely on compounded medication. We also offer a wide variety of vitamin supplements, each designed to promote your well-rounded holistic health. Visit our website to learn more about compounded medication, or call us directly at 310-284-8675.